Just as the sun’s rising is manifest by prayers. 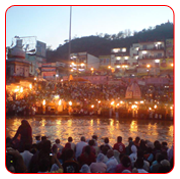 Each evening as the sun’s last rays reflect off the endless waters of mother Ganga, we congregate for the Ganga Aarti. This divine light ritual is filled with devotional prayers, songs, rituals and a palpable sense of the holiness of mother Ganga. The Aarti, an ornate oil lamp, lined with dozens of inferno burning in pure ghee- is offered to god. We give gratitude for the blessings bestowed upon us that day, as well as representatively offering light back to Ganga Aarti is a time when we break free from the normal strain & stresses of every- day life, & gather together in joy, peace and reverence. White Water River Rafting, Kayaking and Much More…. For those looking for a corporeal challenge, kayaking, White Water River Rafting, Rappelling, Climbing and Cliff jumping are all available. Of all the rivers of Indian subcontinent, the Ganga is possibly the most beautiful. It originates from Gaumukh in the garwhal district of the Himalayas yoga and is a wonderful river for inflatable rafts. 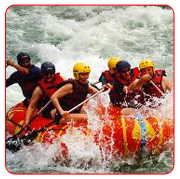 Rafting on its water is an extraordinary expereince & one to cherish. To ride these rapids and to come to the terms with their wildness and potency is to grow in temperament to nurture the very stuff that dreams are made of. On the bank of the river Ganga, a sandy river beach and a fraction of river side forest. An excellent leave from city stress- the tented river camp proffer complete outdoor experience with white water rafting as its very best, solitude, camp games, kayaking, abseiling, campfire tales, good food & new found friends. And for the not so adventurous, a great holiday to put their relax & feet up with a few lazy walks thrown in.climbing, rappelling and cliff-jumping are all available. 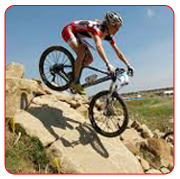 Get on to special mountain bikes, to explore the nearby villages and forests, or ask for a challenging route to push the level of biking action further. Rishikesh Yoga Retreat organises Himalayan Folk Dance Performances and Local Classical Music Recitals occasionally. You can also ask our staff to take you to a neighbouring village to witness the festivities of the several cultural and spiritual events that take place each month. During this visit, you can see the agricultural, herb & rice paddy fields. You are guided by our occupant team of framers to learn more about the various items that are grown in and around the retreat. Activities include planting, weeding, harvesting and watering various herbs and food that go into their rejuvenation oils and food. Please note the agricultural activity is seasonal in villages.